Many sophisticated fraudsters use offshore bank accounts and corporate vehicles to conceal their proceeds of fraud. With many of these offshore jurisdictions having bank secrecy and little public information, fraud fighters often find themselves with minimal options to further investigate the fraud and recover the assets. Learn from those who specialize in offshore asset recoveries what tools and secrets you can use to recover assets for victims. Offshore financial centers are widely used by multi-national corporations, large financial institutions, and high-net-worth individuals for a number of legitimate business reasons, including asset protection, efficient capital flows, international business transactions, and tax planning. But offshore financial centers can also be abused. As a Certified Fraud Examiner who has been investigating fraud in the offshore for the past 25 years, I have seen my fair share of schemes and scams. The offshore attracts perpetrators of fraud (much like it does legitimate business) because it is inexpensive, easy, and private. A person can set up a company for approximately US$3,000�$5,000 and can do it from anywhere in the world. While the registered office of the entity must maintain a register of members and directors, frequently these are not available to the general public. Therefore, other than the person giving the instructions and the registered office provider receiving them (who is bound to a duty of confidentiality to not disclose information), it is difficult to know who owns or directs an offshore corporate entity. The regulatory requirements in most offshore jurisdictions tend to be more relaxed than those that might be seen onshore. While exempt companies, also known as international business corporations (IBCs), are required to be in a position to provide financial information upon request, they are not required to prepare or file annual accounts or obtain audits of their financial accounts. Further, as such entities are tax-exempt, there are no reasons to prepare or file financial accounts. Because of this, many sophisticated fraudsters use the offshore as part of a strategy to conceal proceeds of fraud. In this paper, we will discuss the most popular means by which the offshore is used in illicit schemes, what tools are most often used for investigating fraud, and why those tools are effective. The two primary methods offshore jurisdictions are used in a fraud are: (1) use of IBCs to conceal the true ownership or control or (2) the use of an offshore bank or brokerage account to launder crime proceeds. IBCs are the most common means through which frauds are concealed in the offshore. As mentioned above, IBCs are cheap, fairly easy to arrange, and not subject to public disclosure. Upon provision of anti-money laundering documentation and payment of the fee, the company is incorporated. It is often the case that the registered office provider acts as nominee director or shareholder of the offshore entity. The IBC allows fraudsters the ability to conceal their true ownership and control. They can layer the concealment by naming nominees to act as directors and shareholders, or by introducing additional IBCs from multiple jurisdictions. This is demonstrated in the chart below. There are a number of combinations and permutations that a fraudster can use to conceal and layer illicit proceeds. Many of the more complex cases involve IBCs in multiple jurisdictions and the addition of trusts, foundations, family members, or colleagues into the ownership or director structure. A further dynamic is to involve entities that provide services, such as consultancy or import and export, that try to insert a sense of legitimacy into the structure. All of these combinations and permutations can make investigating the fraud even more difficult. Another common feature of offshore frauds is the use of an offshore bank account or brokerage accounts. Recently, these have become much more difficult to open, and unless there are substantial amounts involved or the introduction of a local service provider is secured, it is probably cost prohibitive to pursue. The days of numbered accounts are over, but people still use Hold Mail or have mail sent to the registered office provider, which allows for confidentiality to be exercised on what mail reverts to the fraudster and how that is delivered to them (e.g., electronically via email or text). The bank or brokerage accounts are usually set up in the name of the IBC described above, and depending on what the fraudster has put in place, authorized signatories who are nominees for the fraudster and who act on the fraudster's instructions might be established. It is not odd to find situations where the entities, bank accounts, brokerage accounts, or other vehicles used by a fraudster in an offshore fraud include no direct reference to the fraudster. One of the common themes consistent throughout the offshore frauds that occur is that the assets and information that will assist in proving the fraud or ownership of the assets is not offshore. Fraudsters rarely leave big sums in bank accounts in the offshore just to earn minimal interest. They want to enjoy the fruits of their fraud. This includes owning luxury homes, private planes or yachts, gambling, and generally living the high life. While a fraudster can acquire properties offshore, in the majority of cases I find that those who have committed crimes and stolen sums want to enjoy them onshore, and in some instances, not too far from home. They also tend to use local attorneys, local accountants, and other professionals who they are familiar with to manage their assets or assist with concealing and layering their fraud. The reason is quite simple. Part of the success of a fraud is to keep it secret, and one way to do that is to limit involvement to a small number of trusted parties. For this reason, close friends and family members are frequently implicated. When I am retained to provide guidance or in an asset recovery case, my first questions usually focus on the fraudsters: Where do they reside or operate? Where do they spend their time? How do they live? The more information I have about the fraudster the easier it is to identify potential targets for information and assets. The fact that important information exists onshore does not mean there isn't information offshore that could assist. Assuming you can gain access (discussed in further detail below), there is certain information that can assist in finding assets or determining who might have other useful intelligence. The primary source is the registered office service provider. Many of the registered office service providers are affiliated with law firms. That is not surprising, as it is likely that those persons who perpetrate frauds and are looking to incorporate offshore entities will want to obtain legal advice. The attorneys, assuming the communications are not covered by attorney-client privilege, might provide another source of potential information. For instance, knowing who might have referred them to the law firm or how the invoice was paid could be beneficial. Combined with general local knowledge of how or why offshore entities are incorporated, you can put together a general strategy. For example, if the registered office of an entity incorporated in the British Virgin Islands also has a presence in Panama, there will almost certainly be a Panamanian connection, particularly if the fraudster has connections with Latin or South America. 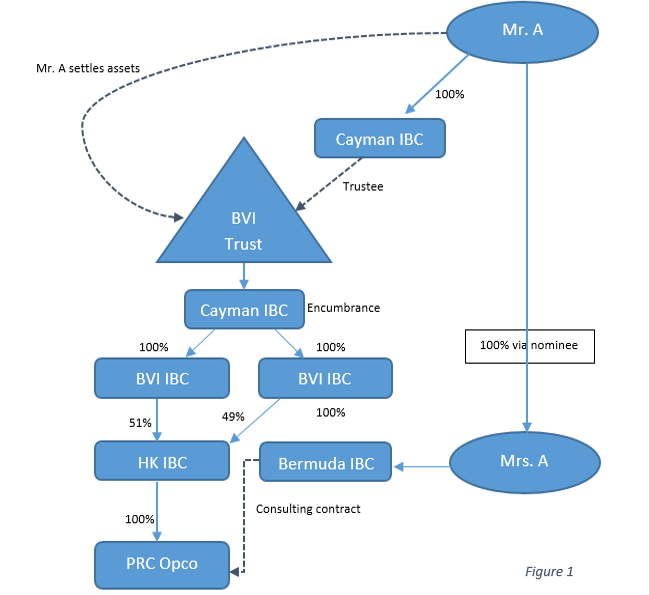 Similarly, if the registered office of a Cayman entity is connected with a subject from the People's Republic of China, then potential target locations are Hong Kong and BVI. In addition, the local registered office service provider might have other useful information in his files. In most offshore jurisdictions, registered office service providers are required to collect and keep, pursuant to local anti-money laundering laws and regulations, personal information on the customer and ultimate beneficial owners. This usually means, at a minimum, copies of their passport and utility bill. However some service providers are more diligent than others, and they might have notes on the subject individual, like the "purpose" of the offshore entity or the "source of funds." They might have requested information regarding the purpose of the transactions for which the entity is being used. In addition, the registered office service provider will have records on the source of any money paid to them to incorporate the entity, which more often than not will be a wire transfer. This will assist in determining any other bank accounts the subject person might be operating, or whether a family member, colleague, or professional is aiding and abetting in the fraud. The registered office service provider might also have the name of an introducer (or referee), which can assist with identifying anyone else who might have information on the subject and the alleged fraud. To the extent the names of directors or registered members are colleagues or family, you will again have potential additional sources of information. IBCs are one of the more popular offshore structures3 for asset protection and privacy purposes because information relating to the ultimate beneficial owners can be difficult to obtain. However, that does not mean that no information is available or that even ownership information cannot ever be discovered. 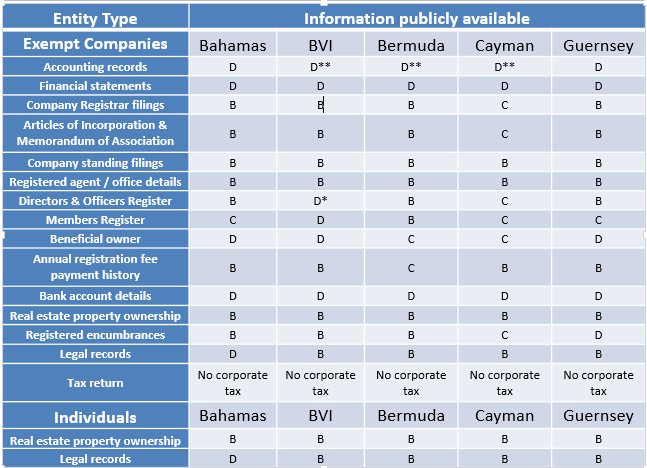 Table Key: *There are new provisions in BVI that will require a register of directors to be filed with Registrar of Corporate Affairs in 2016/2017. ** Requirement that you can obtain information to prepare accounts or know where accounting information is held. Norwich Pharmacal Order: This civil disclosure order is available against third parties before suit (who are unlikely to be parties to any contemplated substantive action) who have facilitated or become involved in arguable wrongdoing, whether intentionally or otherwise. Often, these orders are applied for against registered agents holding details of the actual owners or ultimate beneficial owners of offshore entities; however, they are also useful in finding out details of bank accounts, account signatories, bank mandates, sources of payment for the Registered Agent's fees which often identify the location of a previously unidentified bank account), and other similar information, including where that information is held outside of the immediate jurisdiction but with entitlement to hold it within the jurisdiction. Usually requested ex parte and combined with a gagging order to maintain confidentiality, they are used where information could assist in proving evidence of wrongdoing or that the person against whom the order is sought knows the identity of the alleged wrongdoer. Bankers Trust Order This order is a variation of the Norwich Pharmacal order; it is a civil disclosure order against banks that circumvents usual bank confidentiality rules. Unlike a Norwich Pharmacal order, it is available to parties where they have a proprietary claim in assets and there is a risk of dissipation of those assets by the alleged wrongdoer. It is used where there is already a prima facie case of fraud or breach of trust and the information is required from the non-party bank to recover, trace, or preserve those assets subject to the proprietary claim; again, usually ex parte and combined with a gagging order. Anton Piller Order (now known just as search order): This is a search and seizure order that is available in situations where there is convincing evidence that the respondent has in its possession incriminating materials or information and that there is a real possibility that it might destroy such material before discovery; again, usually obtained ex parte. Disclosure Order: This is a court order available to preserve relevant property and to order the defendant or third party to provide information about the location of the relevant property, which is "the subject of a claim," Again, usually made ex parte but at the same time as the filing of a claim, although in extreme cases can be made before a claim is filed. This procedure can be used to secure assets being traced and to obtain information relating to assets from the defendant. Such orders can also generally be made ancillary to a freezing order, such as a Mareva injunction, which, if served on a third-party bank, can be used to discover evidence of bank accounts or other legal or beneficial assets held at that bank. Letters of Request: These requests are typically directed at obtaining documents and answers to interrogatories. The court grants requests from overseas courts, including where the request is for direct evidence that can be used in civil or criminal proceedings in the relevant foreign court. One of the most powerful tools used offshore to investigate an alleged fraud is the appointment of a liquidator by the local court over the subject offshore corporate entity. This is described as a winding up petition and is also referred to as a compulsory winding up or liquidation. There are various grounds on which such an application can be made. The more common is that a company is unable to pay its debts, or the court is of the opinion that it is just and equitable for the company to be wound up. For example, where a fraud has occurred, a victim could make a demand of the fraudster's offshore entity to repay the stolen asset. If the demand goes unanswered, the claimant can then demonstrate that the company is unable to pay its debts and pursue a winding up order. Alternatively, and particularly when the claimant (victim) does not want the fraudster to be aware that the claimant is aware of the offshore entity or intending to take action, or where timing is important, then a "fair and equitable" application may be used. In these circumstances, the threshold is that the victim is able to demonstrate a bona fide case that a fraud has occurred and that the subject entity either received the benefits or aided and abetted in that fraud. The local judiciary would need to be persuaded that an independent investigation is appropriate and that it should use its powers to appoint an independent party (the liquidator) to conduct the investigation as officers of its court. At times, the court will require the legal entity to pay the petitioner's costs in winding it up. Legal advice should be sought in all circumstances. The person appointed by the court is a liquidator, and as implied in the above, this person is an officer of the court, has fiduciary duties and responsibilities to the court, and, when appropriate, can seek direction from the court. The liquidator typically only seeks the direction of the court when a proposed action is, or could be interpreted to be, outside the powers given the liquidator as set forth by the court. 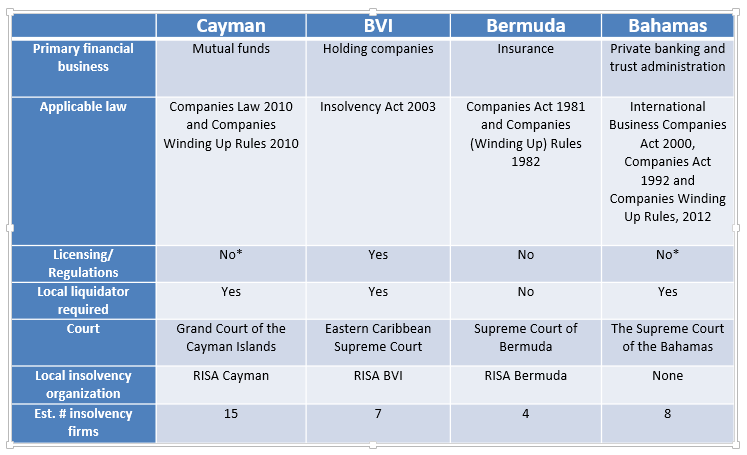 The insolvency laws in many offshore jurisdictions require that at least one of the liquidators appointed is either resident in the islands or a licensed insolvency practitioner. Joint appointments are common, particularly in cross-border situations. Having joint officeholders provides the benefit of getting local knowledge both onshore and offshore. There is other legislation that may apply in an insolvency context, depending on the type of vehicle that is being wound up or whether the winding up involves a regulated business. The above schedule just highlights the primary legislation. * In the Cayman Islands and Bahamas, the insolvency legislation requires that liquidators meet certain residence, insurance and experience requirements. Selection of Liquidator: Usually, the court gives deference to the professional that the claimant has selected unless there is good reason not to do so. The professional put forward generally needs to demonstrate that they meet the local requirements (which might include that the candidate have insurance coverage) and be independent. The candidate officeholder usually needs to provide the court with consent to act. This process gives some assurance to the victim that someone independent is conducting the investigation and collecting the assets. Costs of the Liquidation: Costs of the liquidation, as approved by the court, are paid from the assets of the entity being wound up. In instances where there is some uncertainty as to whether there will be sufficient assets to cover the fees and costs of the liquidation, some professional firms are willing to accommodate those concerns. For instance, my firm is open to discussing a fixed "on-spec" fee, which usually incorporates a fixed fee for specific steps or staged process. Some jurisdictions allow for contingent fee proposals. A further possibility is to identify litigation funding. Transparency of the Investigation: In most English law-based jurisdictions, where a compulsory liquidation occurs, the liquidators are required or encouraged to appoint a creditors committee for the purposes of consulting on matters pertaining to the liquidation and approving their fees. During the consultation process, the committee, which comprises three to five creditors who are representative of all creditors, are asked to provide their views and perspective on matters, including whether to commence legal action against certain parties. Committee members are not paid for their services, but their out-of-pocket costs might be reimbursed. Powers of the Liquidator: As officers of the court, liquidators have broad powers to examine persons who might have information or knowledge that will assist their investigations. That being said, there are also limitations. Unless the liquidator is recognized elsewhere, the liquidator's powers might be limited to the jurisdiction of appointment. However, I have seen financial institutions or service providers, mindful of their duties to comply with international protocols, agree to be examined as long as there is a statute in the respective jurisdiction that gives the liquidator similar powers. Additional Remedies Available: There are remedies available in liquidation scenarios that are not available to individuals or corporations outside of liquidation. These include preference claims, fraudulent conveyance claims, or claims for below market value transactions. These remedies can be used to identify other means of bringing assets into the company's estate. In some instances, the thresholds for successful prosecution of these remedies does not necessarily require that you prove that the party that obtained assets intended to deceive or divert the assets. All that might be required is to show that the transfer was made for insufficient value and that the company was insolvent at the time of transfer. Recognition in the United States or Elsewhere: One of the most difficult aspects of an investigator's job is getting access to information or assets outside their jurisdictions. Offshore liquidations are useful in this regard as courts in the United States and elsewhere have been willing to recognize "foreign representatives" in foreign liquidation proceedings in their respective jurisdictions. In effect, such recognition gives the liquidator the same powers as a U.S. bankruptcy trustee to subpoena for documents and information. It also can be used to seek recognition of any local remedies that need to be exported onshore. See Morning Mist Holdings Ltd. v. Krys (In re Fairfield Sentry Limited). Seeking Court-to-Court Assistance: As a winding up proceeding is a legal proceeding where the liquidator is an officer of the court, other courts are often willing to assist the liquidator. For example, we at KRySGlobal were appointed liquidator in a matter involving a BVI entity in which our inquiries had identified that one of the directors, an attorney, and the principal banker were in Israel, but efforts to seek their cooperation in obtaining books and records was proving difficult. We sought and obtained the assistance of the BVI court, which issued a letter of request asking the Israeli court to allow the liquidator to use the same powers that are available to the court-appointed liquidators in BVI to examine parties in Israel. The Israeli court granted assistance to the BVI court�the first time this had happened in Israel�allowing the liquidator access to bank records and other documents relevant to the investigation and to examine the directors and service providers. Authority to Remove and Replace Legal Representatives: One of the common features of Asian frauds is the use of multiple entities across various jurisdictions, similar to the flowchart we highlighted at the beginning of this document. To the extent the top entity is an offshore entity, and a liquidator is appointed over it, the liquidator will be in a position to replace (as the sole shareholder in the scheme) the directors of underlying entities and have those new directors (who are usually members of his team) investigate the entities' activities and gain access to information and assets. This can be quite an inexpensive and effective tool, particularly in jurisdictions where procedural rules and processes prevail. Victim's Role in the Liquidation: In most jurisdictions in the offshore world, the statutory laws require that the liquidator constitute a representative group of creditors or members to approve his fees and to consult from time to time. While the representative committee is not paid for their services, it permits victims to take an active role in the litigation strategies and possibly settlement discussions with key constituents. In many of the estates I oversee, our committees are required to sign a joint interest and confidentiality agreement so we can share legal advice and strategy papers. Armed with these powers and remedies, a liquidator has the tools and the capabilities to investigate fraudulent transactions and locate and procure assets for the victims of fraud. The following is an example of a successful fraud investigation undertaken through a liquidation. I was appointed liquidator over a $60 million investment scam that involved two Cayman entities. The Ontario Securities Commission had appointed a receiver over a fraudulent investment scam in Canada, and various entities were involved in both the Cayman and Canadian scam. The principal was a Canadian who had fled Canada, and his whereabouts were unknown. Initial inquiries indicated assets might have been diverted to Luxembourg and Iceland. Much of the information and assets necessary to effectuate the liquidation were located outside of the Cayman Islands, including securities held by a custodian in Canada, over which a freezing injunction had been granted. Litigation had also commenced in Canada against the Cayman entity, and the liquidators required documents from service providers and third parties outside of the Cayman Islands to assist their investigation into the entity's affairs. Further, a property in Florida was suspected to have been purchased with misappropriated funds. We sought recognition in Canada and entered a protocol to work with the Canadian receiver, which included information sharing and employing a joint strategy. We proceeded to seek discovery in the United States and elsewhere on the funding for the Florida property. Working together with the Canadian receiver, we were able to avoid any question or dispute as to whose interests we were acting for, and were able to successfully obtain the assistance of many parties with information. These actions drew out the principal who approached the liquidator to settle. The settlement included a cash component and full accounting of what happened to the funds. We were able to pursue other remedies to recover lost funds and eventually transferred all recovered assets to the victims. In addition to appointing liquidators, other viable options also exist. To the extent that there are bankruptcy proceedings elsewhere, for example the United States, the trustee can apply to the offshore court to seek assistance in obtaining access to information or assets. However, the benefit of appointing a liquidator is that their broad powers permit them to gain access to information more easily and assume control of assets more readily. This allows for a broader investigation, and to the extent the assets identified are not sufficient to cover the losses to victims, alternative options can be pursued, including litigating against service providers who did not comply with their duties and obligations and might have "deep pockets" to pay any successful claims. A liquidator, as an officer of the court, would not be in a position to pursue claims that do not have merit or are cost prohibitive. And to the extent there are insufficient assets in the estate, the liquidator would need to provide comfort to the court that they could pay the legal costs and any possible adverse cost orders. This can be addressed through arrangements for litigation funding or after the event insurance. Liquidators who have experience in these types of frauds have contacts in these fields. Frauds that involve offshore jurisdictions are difficult to investigate, usually because of the lack of public information and the restrictions in getting access to such information. The courts in these jurisdictions are open to assisting with the appointment of a seasoned liquidator, one with a reputation for finding creative ways to get access to information and recover assets. The court appointment of such a liquidator is a powerful tool. Even if it is unsuccessful in identifying assets, it might bring the fraudster to the surface and put the victims in a better position to negotiate return of some of the stolen funds. 2 In some civil law jurisdictions, it is necessary to also commence criminal proceedings at the same time. 3 Other offshore structures include offshore partnerships and trusts, as well as private foundations. 4 Exempt companies are entities that are incorporated offshore but are not allowed to trade or conduct business domestically. In most of these jurisdictions, there are different rules for obtaining information on domestic or regulated companies.